Attribution modelling for Websites on Google Analytics used to be a complex task. One of the most significant issues was that very few people understood what it was, how to measure or why it was important. We set out to make this important and misunderstood issue clearer. With that we also hope to explain why it is important. Attribution modelling charts and measures the effectiveness of a media channel and its impact on other channels. In simple terms it tries to work out which media delivers the most benefit and revenue to you. In offline media the task is simplified because nobody actually knows for sure. You can’t measure offline marketing very well and so everyone goes with a gut feel based on broad indicators. Online things are very different, with each session tracked through from initial contact channel right the way through to repeat and regular sale. A consumer sees a PPC ad for a product or service and clicks on it. They look around the site, and then leave to do more research. A few days later the consumer decides to go back to the website to compare a few additional points alongside the research they did on other sites. For this they use Google to enter the name of the company and click through to the site. This leads to a second session, with more pages visited and potentially some questions asked via a contact form on the site. The consumer receives a response to their question the following day and in it is a link to a page on the website. They click it and review the information contained in a further session. A few days later the consumer has completed all their research and is ready to purchase. They enter the name of the website into their browser and navigate directly to it. They then click on the product they want and complete the purchase quickly and efficiently through the eCommerce functionality on the website. Using Last Click Attribution Modelling we could learn several things from this exchange. Our PPC advertising is creating traffic on our website but not generating sales. Something must be wrong with our advertising. Organic traffic seems to be engaged and is leading to requests for more information on the website. We can use this to make our navigation and user journey better. Users like our email responses and are looking at our site to get all the information we can. Perhaps we should add discounts to see if that gets them over the line to purchase. The best traffic we have comes from people who already know where we are and what they want. All other traffic is secondary to this important segment. Clearly the points taken are not all correct and some of them can be misleading. The example is fairly typical for how many consumers use websites, and so the misunderstanding is also quite common. The main point about Last Click Attribution Modelling is that it usually over states the value of direct traffic and understates the value of other traffic. It can also tempt marketers to discount products when this will not actually increase sales, or quantity. This form of modelling is certainly useful in order to see how users place their orders with you, but it does not tell the whole story. If you limit yourself to this method then you leave yourself open to potentially damaging business decisions. The key point to realise about First Click Attribution Modelling is that it looks at a conversion process across all sessions, not just the final one that leads to a sale. Therefore it appreciates the entire user journey and the channels that led to its ultimate conclusion. Using the same example as above, Last Click Attribution might very well lead to completely different conclusions. Cusotmers find our website for the first time as a result of our PPC advertising. Our organic search traffic is led by people who already know our brand name but not as a way to discover the products and services we offer. Those that do know us are engaged and contact us as part of the sales process. Users like our email responses and are looking at our site to get all the information we can. This often leads to a subsequent sale. When a user is ready to purchase they already know our site and complete the process efficiently. With this technique to look at website behaviour the conclusions are considerably more useful. The secret is the data is more complete. 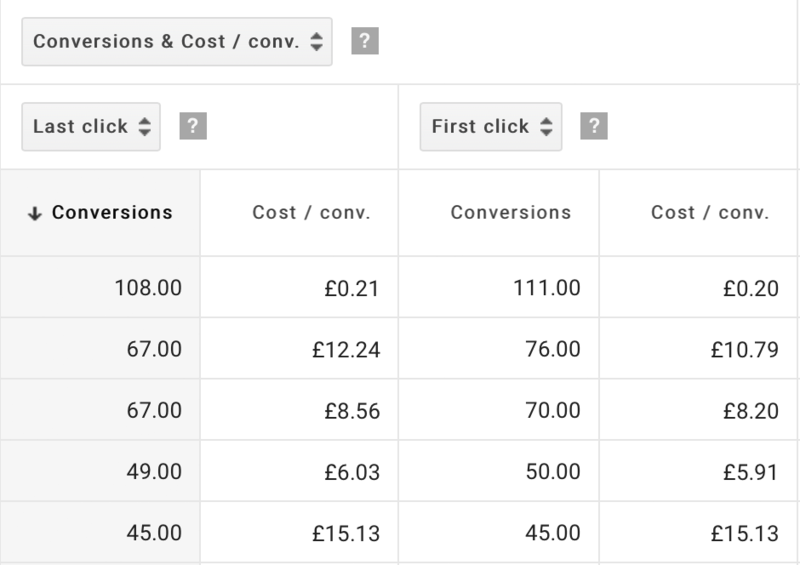 It is often a good idea to look at First and Last Click Attribution models alongside each other and look at the different values for conversions and Cost per conversion. Sometimes there can be very little difference but others the difference can show dramatically. The more difference there is, then the more that we can learn from it. At Be Different we constantly refer to this and other Attribution Models to demonstrate effectiveness for PPC and SEO services. We download information from Adwords and integrate it with Google Analytics on our own platform. It requires a deep knowledge of both platforms, and we consider ourselves experts in this area. We provide this service to clients such as, Tonik Energy and Into The Blue Experience Days. Please get in touch if you would like to know more about Attribution Modelling and how it can increase sales.